For car, truck, SUV, jeep, or minivan. Rampage 12 Volt back seat car heater with fan for your car, truck, suv, jeep, or minivan. The 12 volt car heater / fan provides instant warmth and air circulation on those cold mornings or evenings. Features a speed dial as well as an on/off switch. The airflow of heat can be easily directed with the handy swivel mounted bracket. Aim at the your legs, the side windows, the rear windows, or your cold hands. This compact 12 volt heater will wire easily to your vehicle. 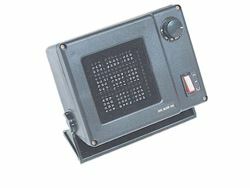 Warms your vehicle's interior quickly with its powerful 300 watt heater. Made by Rampage Products.